Microsoft’s Office suite for Android and iOS is now free. Microsoft have been pretty generous as of late, starting with first a strategic partnership with Cloud giant Dropbox for an integrated offering across their cloud platform to edit Microsoft Office documents direct from the mobile app. Definitely a useful feature. Most people are using Dropbox instead of Microsoft own OneDrive although OneDrive is fast improving and does offer more storage space (15gb vs 2gb on sign up). But let’s face it, if you are using a mac, you would be using Dropbox over OneDrive. Free mobile Microsoft Office is their latest step in aggressively pushing adoption for Microsoft Office. If you used Word, Excel and PowerPoint documents, it is definitely a good move to use the Android or iOS app. On the desktop you can use the web-based office apps that runs on the cloud. While consumers using Office mobile will be able to access the apps for free, Microsoft would not be so kind to their bustiness customers. An Office 365 subscription will be required to edit documents that are stored on OneDrive for Business or Dropbox for business, so you would need to switch over to your personal account. In addition, Microsoft would also be restricting some chart element customization and track changes to paid customers, making them premium features. One aspect I didn’t like about the mobile office on Android was that I could not save files to local directories and could only save it to my OneDrive. A subtle ploy for people to switch over to the OneDrive application. Google in comparison offers more flexibility. As it is, I currently have my documents across two platforms, Microsoft OneDrive and Google Drive. There are advantages to both that I have not come around to choose a default winner, which irritates the hell out of me to. However, I seem to be siding more towards Microsoft for now, for the management of office documents both in their native format and in the cloud or offline, although I have 100gb on Google Drive that is currently left under utilised (#firstwworldproblems). Google is fast catching up, with ability to export files to third party editors and also, useful additions such as Google Forms / Spreadsheet that allows you to do nifty stuff like a . 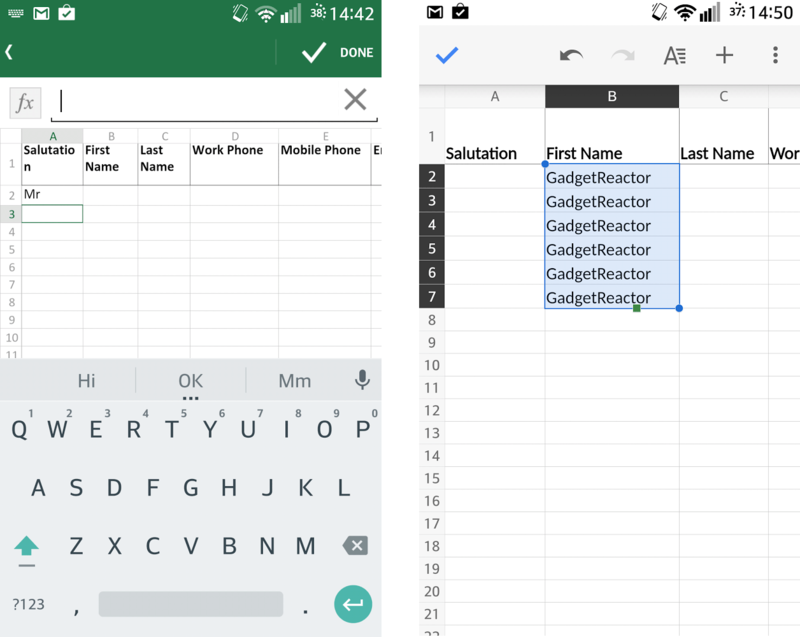 Just today, I had to edit a spreadsheet and I decided to do it via mobile. The spreadsheet was in the Excel xlsx format, which is supported in either mobile apps, Microsoft Office or Google Sheets. I chose Microsoft Office as I wanted to ensure maximum compatibility for other Office users when I email the file out. Although I think Google Sheets is more than capable to handle basic editing of spreadsheet. The true test would probably lie in Powerpoint presentation formatting and those tables in tables with word documents but I am not too keen to do that on a mobile platform just yet. On Microsoft Office, entering text into fields was pretty easy but when it comes to copy and paste, the format and layout was still rather tedious to use. In comparison, Google Sheets allowed drag and drop of cells to duplicate their content, just like on a desktop computer. Notice the extra green knob on the cell. Useful! For now, both apps would still be residing on my phone. I cannot download the office in my note 4. I could not search the Microsoft office app directly in Play store. I have to follow through the download link found in Microsoft website. Once I clicked the link, it directs to play store where I see ‘Your device is not compatible with this version’. I am able to install this app on my other mobiles. In my All my mobiles, I’m using same Google account. Is there any restriction to install this app on Note 4?? Hi Murugan, the Note 4 is currently identified as incompatible or haven’t undergone sufficient testing. Official statement is this is due to high screen density of the Note 4, but users have reported that the app works well. You can sideload it via http://www.apk4fun.com/down/1543/. Be careful though, not sure on the authenticity of the source, and you may want to wait for the official version.